2019 Breckenridge Sunday Market Registration is open! If you’re a returning vendor or have been approved, please use this form to pay with. 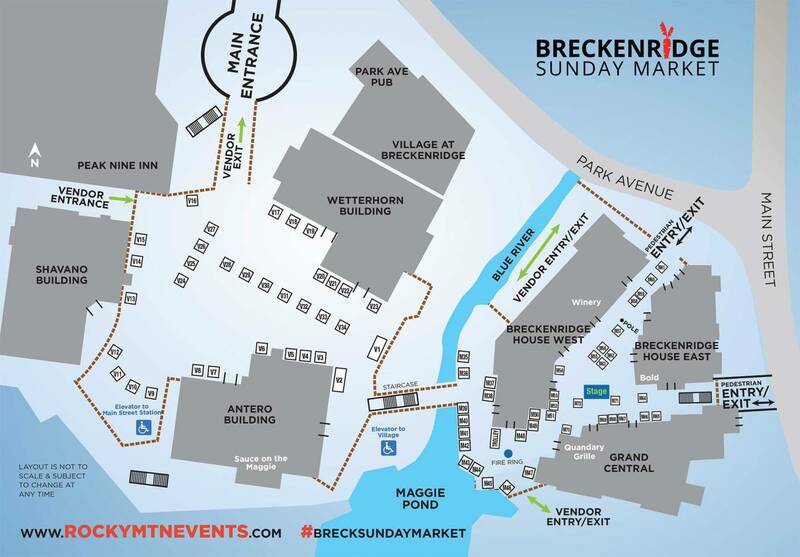 The Breckenridge Sunday Market is managed by Rocky Mountain Events and will take place every Sunday from June 16 – September 1st, in the Main Street Station Plaza. All vendors need to download, print, fill out and sign the following forms and bring them to the next Sunday Market. Breckenridge has been referred to as “the perfect mountain town” and is a prime destination for travelers. 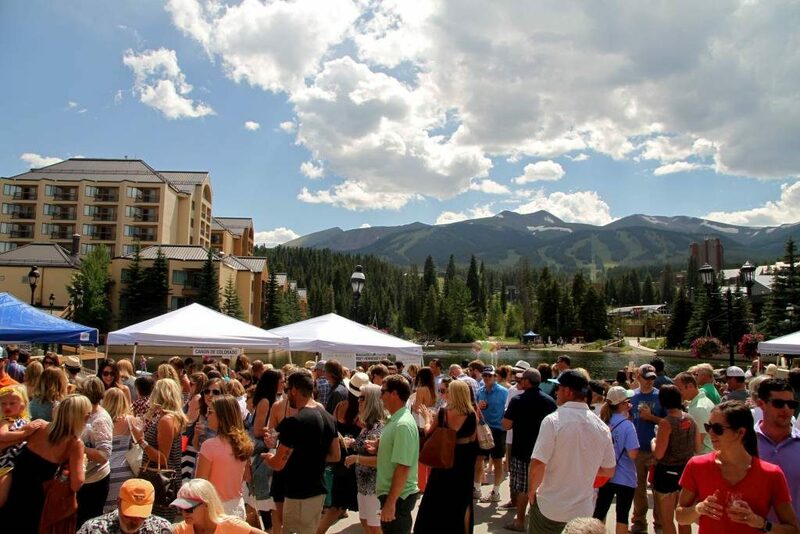 The real essence of the Breckenridge Sunday Market is the sought-after, mountain vibe. Main Street Station Plaza is tucked next to Maggie Pond with stunning views of the Ten Mile Range, especially Peak Nine. Breathtaking! The location is also ideal for shopping as it is close to the Breckenridge downtown core and Main Street. Merchant diversity enhances visitation while hundreds of lodging units are just steps away. See more fun facts below. The year-round population of Summit County is nearly 30,000. Thousands upon thousands of visitors make their way to Breckenridge to experience a slice of the mountain life. Although we can never guarantee what Mother Nature has in store, we can share that the average summer temperature is 70 degrees during the daytime with thirty percent humidity and 300 days of the sunshine. Yes. We know. Almost perfect! Main Street Station has underground parking for shoppers and visitors, free for the first two hours. Do you have questions about vending at the Breckenridge Sunday Market? The following information may be helpful for you. What are the market dates? The 2019 market dates are each Sunday from June 16th – September 1st. On September 1st, the market will be extended by one hour for the Labor Day Weekend traffic! All applications will be evaluated. The Breckenridge Sunday Market Committee, (BSMC), will select vendors based on products, quality of items, the appearance of booth displays, customer service and prior record, if applicable. Once accepted, you will be required to obtain a Breckenridge Business License. Food vendors will be required to complete a Temporary Food Events Application. Will I be accepted every year? The BSMC will review all applications to ensure that a good balance and diversity in products is achieved. This process does not guarantee annual entry. Please note, however, that your previous record will be taken into consideration when selecting vendors. What if I cannot attend every market? Priority will be given to vendors who can attend all dates. Although full-time vendors should be present for all markets, we understand that unique situations occur. Please note which dates you are available to attend on the market application. Fees will not be reduced. All vendors must comply with the Red, White and Blue Fire Department rules and policies. A Compliance officer will visit each market to ensure that businesses have their license displayed. Those that do not have their business license, will receive a court summons per the Town of Breckenridge. All Vendors are responsible for your remittance of sales tax to the Town of Breckenridge. Food vendors will follow The Environmental Health Department Guidelines and will complete the Vendor Application for Temporary Food Events. You will be notified by the event organizer if you have been accepted into the market. Please note that upon acceptance, all fees will be immediately due. Please contact us with any questions regarding registration or your business license. We understand that life happens. Vendors who cannot attend a market must notify the Director by Tuesday at 4:00pm, before the missed Sunday event. Violation of the notification deadline will result in a deduction from the deposit. Vendors who fail to attend without any prior notification will incur a $50.00 fee, deducted from the deposit. Vendors must be on-site and with vehicles removed from the designated load-in zones by 8:30am. Late arrivals are not permitted to enter the market and will receive a $25.00 deduction from the deposit. The market hours will be publicized from 9:00am – 2:00pm. Vendors should be open for the duration, rain or shine, so long as participation is safe for all parties. A $25.00 deduction will be taken from the deposit from those who attempt to break down their booth early. Vendors are required to leave no trace after event departure and are responsible for leaving their space free of debris and recycling. Vendors who leave any trash, recycling or other items will incur a minimum of $25.00 cleaning fee deducted from the deposit, or actual cost of cleaning required. Repeat or multiple offenses are not welcome, and all vendors are subject to being dismissed from the market. Please note that there will be no refunds. Please upload at least two photos of your work and one photo of your booth space. Please share any comments or requests with the event organizers. All vendors must carry adequate liability insurance. Proof of insurance or additional insured certificates is required and should be submitted to the event organizer prior to the first market. Additional insured parties include Rocky Mountain Events, the MSS Breck LLC, Main Street Master Association, Resortquest Colorado LLC and Brand Central and Breckenridge Houses East and West Association. Vendors must comply with Red, White and Blue Fire Department rules and policies. The Plaza in Main Street Station is concrete. Fire Department approved tent weights are MANDATORY and must weigh at least 40 lbs per leg and attached to the upper tent frame. Vendors who are selling any type of consumable products are responsible for meeting the Summit County Health Department requirements and must complete a food vendor application. Make Buster, the germ-busting super hero, proud! Only products listed on the application may be sold. Any additions must be approved by the Breckenridge Sunday Market Committee and are not guaranteed. The Breckenridge Sunday Market Committee and Rocky Mountain Events Director reserve the right to deny any vendor that does not properly represent the market or directly competes with the Main Street Station merchants. All vendors must have a Breckenridge Business License. All vendors are required to present, and make their business name clearly visible during the market. Each vendor is responsible for their own items, vehicles, equipment and staff. Booth space is designated for one, single business and may not be shared. The promotor is not liable for any injuries, schedule changes, adverse weather or any lost, stolen or damaged items. Refunds are not granted for any reason including inclement weather or natural/man-made disasters. Failure to comply with local, state, promoter and other governing entities may result in cancellation of market participation forfeiture of all related fees. Vendors agree to be compliant with all rules, regulations and have appropriate documentation on site and should be prepared for inspections by the Red, White and Blue Fire Department, the Breckenridge Compliance Officer, the Summit County Health Inspector and the Town of Breckenridge Business License Authority. I request permission to sell at this market. By doing so, I agree to hold harmless and release any employees or volunteers, directors, representatives and agents of the Breckenridge Sunday Market from and against all liability, claims, demands, losses, damages, levies and causes of action or suits of any nature whatsoever, arising out of or related to my activities at this market. By signing this application, I acknowledge that I have read and agree to abide by all the rules and regulations of the Breckenridge Sunday Market, as well as all laws, codes and regulations of the Town of Breckenridge and Summit County, to cooperate with market management, and to pay the required booth fees which will be due if I am accepted into the market. Thank you for your interest in the Breckenridge Sunday Market!